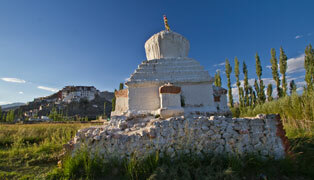 King Gragspa Bum-Lde built the "Red Gonpa" known as Tsemo Gonpa in 1430 AD. 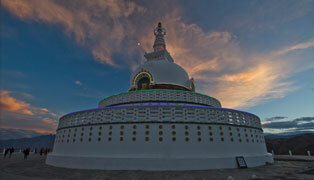 The monument has three-storied Maitriya Buddha's statue and a one-storied statue of Avaloketesvara and Manjushri. The Tsemo Sungbum Chenmo (sacred text) was written in gold and silver, Tisuru Stupa consist of 108 temples, which were remarkable work completed in the reign of king Graspa-Bum-Lde. The Namgyal Tsemo (victory Peak) was built by King Tashi Namgyal after the reunification of upper and lower Ladakh and victory over Hor. Their (Hor) bodies are placed under the image of Mahakala, the guardian deity to stop further invasion of Hor. 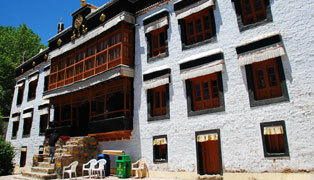 The Leh palace known as 'Lechen Palkhar' was built by Singay Namgyal in the beginning of 17th Century A.D. The nine-storied palace is now deserted, and the ASI (Archeological Survey Of India) has taken up the renovation work. 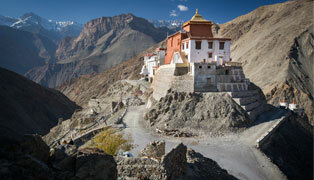 Stok, 14 kms southeast of Leh, is a place, where the present day royal family resides. The three days trek from Stok to Spituk and the 8 days trek of Markha Valley starts from here. King Tsespal Tondup Namgyal built Stok palace & Museum in the year 1825, after Zorawar Singh's annexation of Ladakh. The royal family resides here since Ladakh lost to Zorawar Singh. At present the palace has a collection of royal dresses, old Thankas, King's crown etc. that is open for visitors. Gurphuk Gonpa, a branch of Spituk Monastery is a little away from the palace, which is famous for its festival "Guru Tsechu" held on the 9th and 10th of the 1st month of Tibetan Calendar. which was made by Deldan Namgyal in the memory of his father Singay Namgyal. The statue is the only of its kind in the region. Dresthang Gonpa near the palace was built during the reign of king Singay Namgyal, with a three-storey statue of Buddha. "Shey Srubla" festival is also held here at Dresthung Gonpa. The Rock-carved statue of five Buddha can be seen below the palace on the roadside, which was probably carved during the reign of Singay Namgyal. Buddha statues. 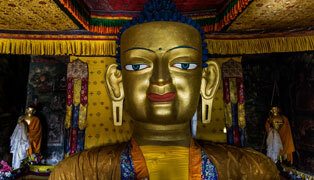 Chamkhang at the top near the courtyard contains the three storey Maitriya Buddha's statue, constructed in recent years. Dukhang at the top, consists of thousand armed Avaloketesvara, Shakyamuni Buddha and Bodhisattavas, Gonkhang contains the statues of Vajra Bhairava, Mahakala & Dharmakaya, the goddess Paldan Lhamo and Cham-sring. Matho Gonpa, around 26km. south east of Leh is the only Gonpa, which belongs to the Saskya order and Lama Tungpa Dorjay founded it in the 16th century and the Gonpa was named Thupstan-Sharling Choskor. In order to introduce the Monastic community, the king offered religious estate in neighboring villages and the Nag-Rang festival was started, which is held on 14th and 15th day of the Tibetan calendar. Stakna (Tiger's nose); 25km. south of Leh, is a small monastery comprising of few Dukhangs, which was founded during the reign of king Jamyang Namgyal, in 1580, by saint Chosje Jamyang Palkhar. The most important statue in the monastery is said to be of Arya Avaloketesvara. The monasteries like the one in Sani, Bardan and Stakrimo, in Zangskar are branches of this monastery. 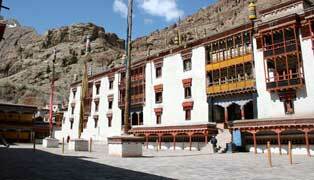 The Hemis Monastery is around 45 km. 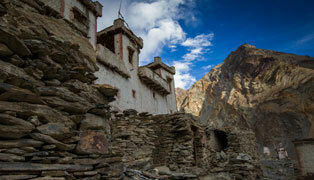 south of Leh, which is one of the largest and most famous monasteries, belonging to the Drukpa order. The monastery founded by the first incarnation Stagsang Raspa Nawang Gyatso in 1630, who was invited to Ladakh by a king Singey Namgail, and offered him a religious estate throughout the region. The youngest son, Nawang Namgail, became a monk and his name was changed to Zamling Drags. The Monastery was named Changchub Samling and the community was introduced. The Hemis festival is held in the month of June. 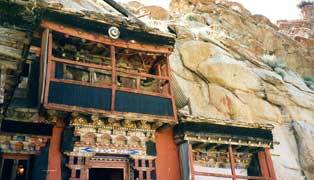 The Takthok (the monastery with rock ceiling); 50km. 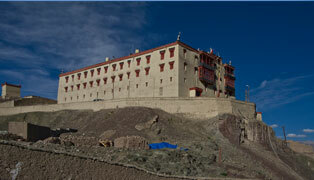 east of Leh, this is the only monastery belonging to the Nimgmapa school of order. The monastery came into existence when Guru Padma Sambhava visited this place and blessed it in the 8th century. The Gonpa was merely a meditation cave of Padma Sambhava, with footprints and many other signs, until the reign of King Tsewang Namgail. When Mahasiddha Kunga Phunstog introduced monastic community. It was given the name of Takthok Padmalinggon. The Takthok Festival is held in the month of July or August. Phyang Monastery, 17km. 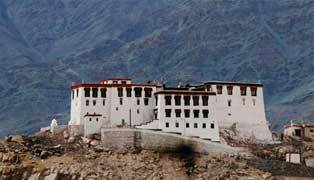 west of Leh is remarkably built on the hilltop, similar to the Likir monastery. This monastery belongs to the Degungpa Order. 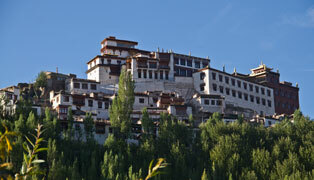 It was the first monastery, which introduced the Degungpa teaching of 'Skyob Jigsten Gonbo' in Ladakh that was founded by Chosje Danma Kunga, during the reign of King Jamyang Namgyal in the 16th Century A.D. It has about 50 monks in residence. 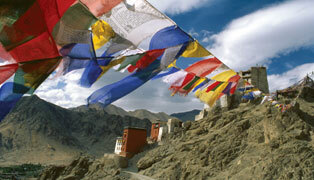 Phyang also has a festival called 'Phyang Tseruk' on the 2nd & 3rd of the 6th month of Tibetan Calendar. 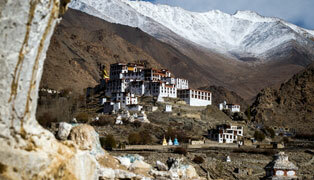 Sumda Chon Monastery is around 65kms to the southwest of Leh, which is connected by a motorable road, upto Sumdo. The track starts ascending to the west, through a gorge from the left bank of the stream. At one point, the track crosses to the right bank and ascent becomes little more difficult. One or two houses come in the way before another gorge appears on the right which leads to the Sumda chon Monastery and towards the left leads to Sumda Chenmo. This track goes along the stream with plantations of Willow. After walking for an hour the monastery appears above the village houses. There is another short track from Alchi Village through Stakspila, the ascent from Alchi is more difficult and long compare to Sumda side. The pass is open only in summer. The Sumda Chon Monastery was probably founded during the period of Lotsava Rinchen Zangpo with Alchi Choskor and Mangu Monastery. The monastery comprises of three temples. The assembly hall has the image of four headed Vairocana, as the central or main image which is nicely decorated probably better than the Alchi and the Mangu Monasteries. The wall has murals of four Buddhas i.e. Ratnasambhava, Akshokhya, Amitabha, Amogasiddhi and Vairocana. Basgo Palace encompasses a rich heritage including historic 75-feet Maitreya (future Buddha statue enlisted as one of the hundred engendered sites of the world 2001 by UNESCO). 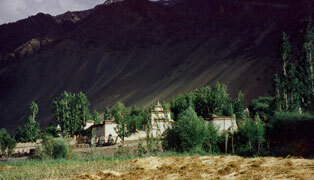 The Basgo Monastery and ruins of Basgo Palace, lie at a distance of 42 km, West of Leh and is on the way towards Sham valley and Lamayuru on the Leh-Srinagar Highway. The village has taken up the task to save the statue housed in a richly decorated structure standing precariously on cliffs some 300 meters above the village level. The Lamayuru “Yungdrung Tharpaling Gonpa” is remarkably built on natural pillar-like formations of sandstone. 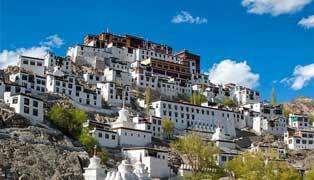 It lies around 125 kilometers west of Leh on the Leh-Srinagar highway. Lamayuru belongs to the Drikungpa order of Tibetan Buddhism. The great translator Rinchen Zangpo constructed a temple here in the 11th century. Naropa also visited Lamayuru, which was taken care of by Kadampa School of Tibetan Buddhism, but later it was taken over by the Drikingpa order. This monastery also have a festival called ‘Yuru Kabgyat’ which takes place on 17th and 18th day of the 5th month of the Tibetan calendar. Likir monastery is situated in Likir village and the village got its name from the monastery Klu-Khil meaning ‘the Naga Encircled’-a myth associated with the founding of this monastery. It is 53 kilometers west of Leh and was founded in 1065 A.D. by Lama Duwang Chosjey during the reign of King Lhachen Gyalpo. The annual monastic festival “Likir Dosmochey” takes place on the 28th and 29th day of the 12th month of Tibetan calendar. 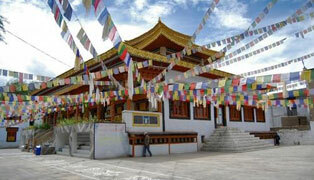 The monastery has two assembly halls, known as Dukhangs and the older one is located on the right of the central courtyard with six rows of seats for the lamas and a throne for the Head Lama of Likir. The Dukhangs contain statues of Bodhisattva, Amitabha, three large statues of Sakyamuni, Maitreya and Tsong Khapa, founder of the yellow-hat sect. Rezong “Yuma Changchubling” is around 73 kilometers west of Leh and to the north of the Indus River from Uletokpo village. 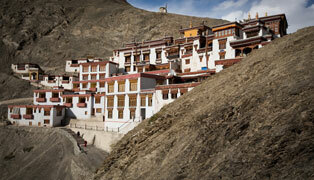 It is a beautifully set monastery at the top end of a narrow valley. The sheer isolation of the monastery provides for a better practice of the monastic discipline for which this Gelugpa order Gonpa is known for. This relatively new Gonpa was founded some 137 years ago by Lama Tsultim Nima, who introduced a monastic community here strictly adhering to the monastic practices. Alchi Choskor is widely believed as the very first Buddhist temple in Leh Ladakh located nearly seventy kilometers away from Leh towards Srinagar. Lostawa (translator) Rinchen Sangpo founded Alchi Choskor in reviving Tibetan Buddhism. Every inch of wall surface of this monastery is occupied by benign images of the Buddha-s, Bodhisattva-s, tantric gods, goddess, flying Apsara-s, Gandharva-s and royal scenes. It is the only monastery that has preserved 10th century Buddhism arts and crafts. The fundamental reason of Alchi Choskor survival is that Alchi Choskhor is enclosed by mud-brick wall and looks simple that it is hardly distinguishable from the ordinary houses of Alchi village. 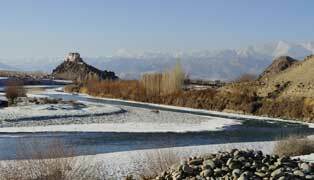 Because of its exterior humble appearance, Alchi escaped attention of invaders from neighboring regions that desecrated and plundered monasteries that were located on the Leh-Srinagar trade route. 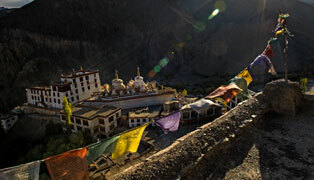 Alchi Choskor has six temples; they are Sumstek, Lotsawa Lhakhang, Manjushree Lhakhang, Vaoirociana temple (Dukang), Kargyur temple and Lhakang Soma.